The Kinergetics chamber environment controller CEC-3 is ideally suited for the control of heating, cooling and dehumidification of a chamber environment. This unit (an upgraded version of the popular CEC-2) has a more compact design and is ideally suited for the control of heating, cooling and dehumidification of a chamber environment. When used in conjunction with a heater chiller skid and habitat conditioning unit, the CEC-3 provides dynamic, refined control of the internal chamber environment. 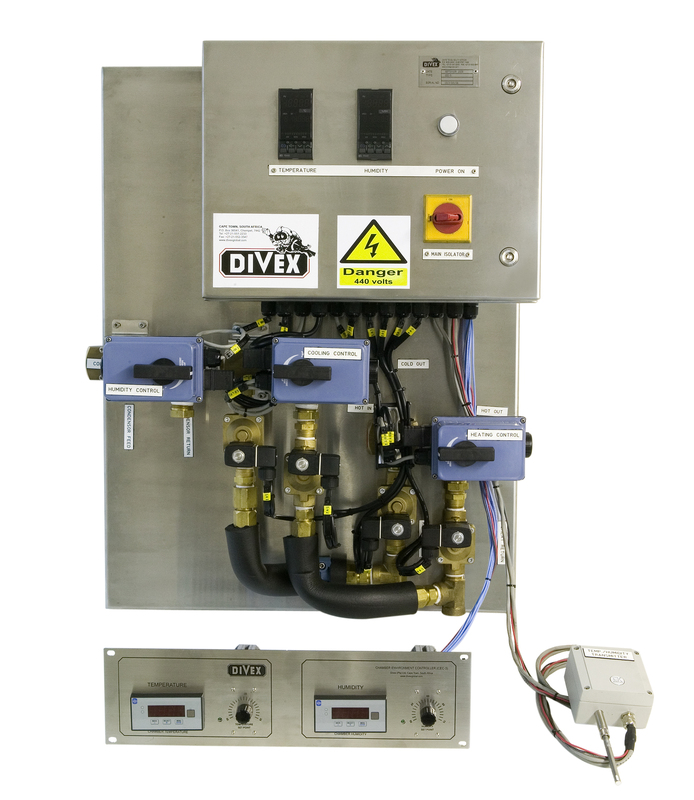 This unit offers a fully remote controlled solution to chamber environment control via a 19" rack-mounted remote control panel. An electrical control panel with two PID controllers that regulate and switch the heating, cooling and de-humidification processes. A piping manifold assembly with solenoid, check and electrically actuated 3-way valves that govern the flow of fluid through the de-humidification and reheating circuits of a hyperbaric conditioning unit. A 19 inch rack mountable remote control panel allowing the remote input of set points and providing operator feedback.